As I was doing some tests to build a SOA (Service Oriented Architecture) app, I realized that I had to take some time to think about logs management. In a SOA app, where logs go ? As a contributor to the Scribe.js NodeJS library, I decided to use it as a log collector that listen at an AMQP queue. First, let’s recap why I need a SOA app. As for now, I was basically creating NodeJS+MongoDB web apps for my sides projects. Things get complicated when the app grows up. There is more and more files and despite the use of NodeJS modules I spend more and more time understanding the code I’ve written 3 months ago and why it’s in this file. Another drawback of the use of a huge single app is that you have to restart everything at every update. Let’s say I’ve coded a little fix for one module. I don’t want to restart all the app to update it. I just want to git push changes for the module and restart it. I’m also tired of the NodeJS+MongoDB combo. I want to split my code into different languages for my sides projects in order to create opportunities to progress with other solutions (Go, Ruby, Couchbase, etc.). I also stated to think about scaling (or at least how to scale if I need to). Having a huge app is absolutely not the best answer. The huge app model vs the SOA model. So here’s the goal : split the app from the huge model to the SOA model in order to manage each part independently (update, scale, …). Of course modules need to talk to each other. And I mainly use HTTP and AMQP (Advanced Message Queue Protocol) for that. Oh yes, sorry … At least now you’ve probably understood my problem : where all logs were emitted from a single app in the huge model, there is now logs coming from everywhere. A solution I’ve found is sending all logs over AMQP to an “aggregator” module that runs Scribe.js. The WebPanel, ie. the Scribe.js web app to manage logs. Scribe.js is a lightweight NodeJS logging module. It basically consists in two ideas : extending the console object and serving a web app to manage logs. The web app allows people to browse/filter/search their logs via an AngularJS app. //that's it, see you at http://localhost/logs for your logs ! It will output something like this in console. For more on Scribe.js, see the Github repo. AMQP is a message broker protocol. I use RabbitMQ as the message broker. There are different patterns such as publish / subscribe, work queue, RPC. 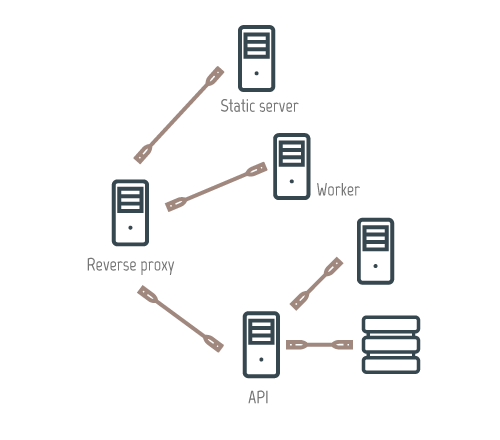 Applications connect to each other, as components of a larger application, or to user devices and data. 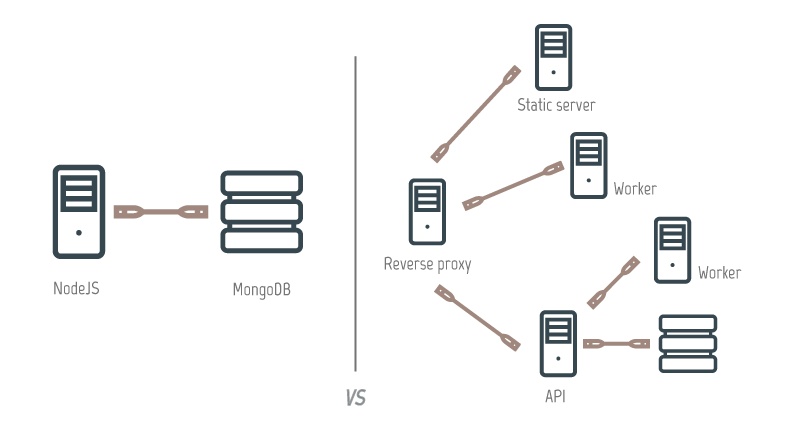 Messaging is asynchronous, decoupling applications by separating, sending and receiving data. The idea is to have a NodeJS module running the Scribe.js web app, listening to an AMQP log queue, and saving all logs send by other modules. Let’s say we have two types of logs (“normal” and “web”, for logging web requests) corresponding to two different Scribe.js consoles. Each console is implementing the basic loggers (log, info, error, warning, dir). And all we have to do now is to consume AMQP messages. 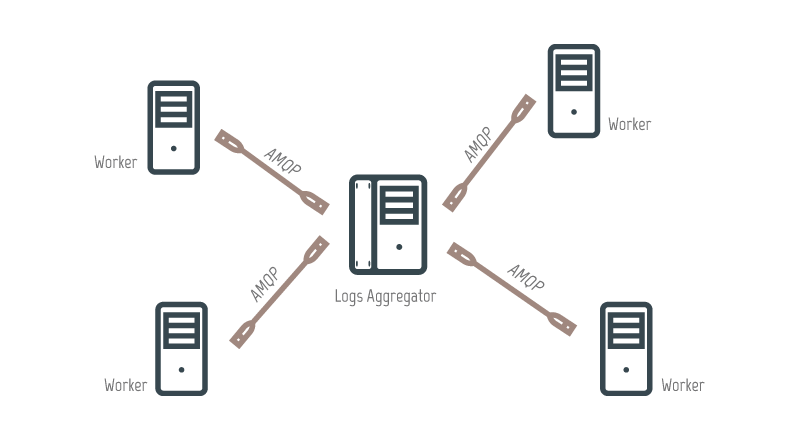 You simply have to pass the normalLogger and webLogger to an amqp consume logic. //build your exchange, bind your channel, etc. You can see an example of server + client code here. I’ve split the amqp logic in two much more generic NodeJS modules (scribe_amqp_server.js and scribe_amqp.js) that you could use with configuration, multiples Scribe.js consoles and so on. There isn’t always a need for big systems and this solution could suit for sure tiny/medium SOA apps.